Although almost unknown in the UK, boat mills were once common in Europe on rivers such as the Rhine, Danube & their tributaries, they were often anchored midstream & could be moved to a different location when the river levels dropped. Compared to inland mills, the boat mills had huge paddle wheels which were sometimes as much as 5 Metres wide & similar in diameter very much like those once seen on rear driven river paddle steamers. These huge wheels were prone to damage from winter ice & floating logs after a storm & many were dismantled or moved to a safe harbour for the duration of the winter. 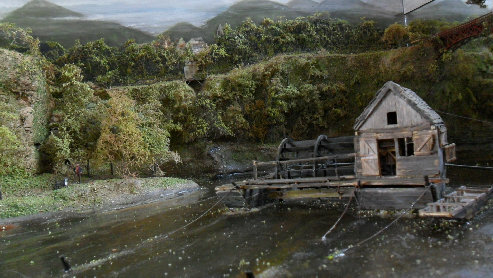 These models are all on display at Bishops lydeard Mill & museum in Somerset England. The miniature displays show how the grain begins it's journey to the mill beginning with an Edwardian two Horse powered threshing machine, a steam powered threshing display, cabinets showing different types of mills including a Roman mill with a wooden pinwheel mechanism and a bakery shop display complete with miniature bread and cakes!